Nettles have a long history of use in the home as a herbal remedy and nutritious addition to the diet. A tea made from the leaves has traditionally been used as a cleansing tonic and blood purifier so the plant is often used in the treatment of hay fever, arthritis, anaemia etc. The whole plant is antiasthmatic, antidandruff, astringent, depurative, diuretic, galactogogue, haemostatic, hypoglycaemic and a stimulating tonic. An infusion of the plant is very valuable in stemming internal bleeding, it is also used to treat anaemia, excessive menstruation, haemorrhoids, arthritis, rheumatism and skin complaints, especially eczema. Externally, the plant is used to treat skin complaints, arthritic pain, gout, sciatica, neuralgia, haemorrhoids, hair problems etc. The fresh leaves of nettles have been rubbed or beaten onto the skin in the treatment of rheumatism etc. This practice, called urtification, causes intense irritation to the skin as it is stung by the nettles. It is believed that this treatment works in two ways. Firstly, it acts as a counter-irritant, bringing more blood to the area to help remove the toxins that cause rheumatism. Secondly, the formic acid from the nettles is believed to have a beneficial effect upon the rheumatic joints. 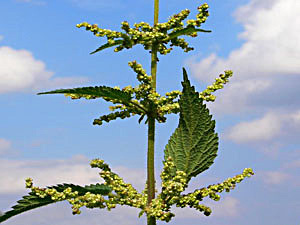 For medicinal purposes, the plant is best harvested in May or June as it is coming into flower and dried for later use. This species merits further study for possible uses against kidney and urinary system ailments. The juice of the nettle can be used as an antidote to stings from the leaves and an infusion of the fresh leaves is healing and soothing as a lotion for burns. The root has been shown to have a beneficial effect upon enlarged prostate glands. A homeopathic remedy is made from the leaves. It is used in the treatment of rheumatic gout, nettle rash and chickenpox, externally is applied to bruises. Waste ground, hedgerows, woods etc, preferring a rich soil and avoiding acid soils. Young leaves - cooked as a potherb and added to soups etc. They can also be dried for winter use. 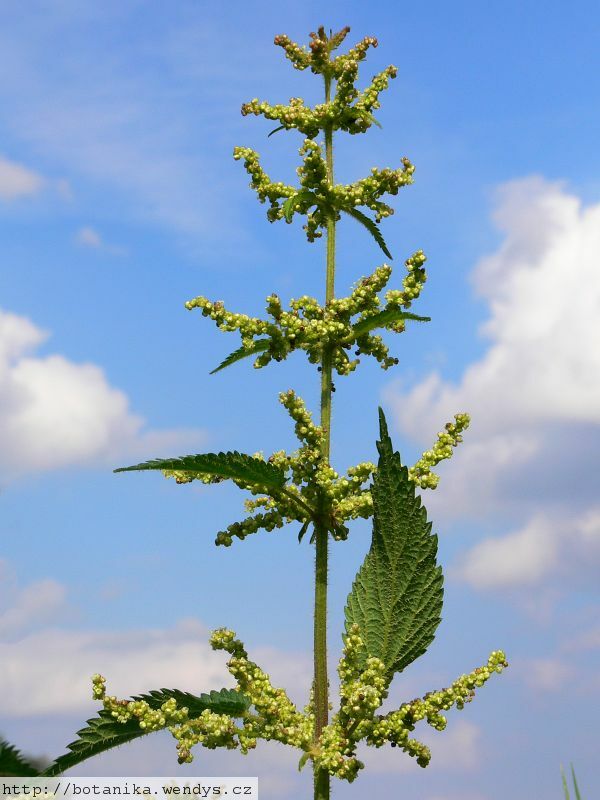 Nettles are a very valuable addition to the diet, they are a very nutritious food that is easily digested and is high in minerals (especially iron) and vitamins (especially A and C). Only use young leaves (see the notes above on toxicity) and wear stout gloves when harvesting them to prevent being stung. Cooking the leaves, or thoroughly drying them, neutralizes the sting, rendering the leaf safe to eat. The young shoots, harvested in the spring when 15 - 20cm long complete with the underground stem are very nice. Old leaves can be laxative. The plants are harvested commercially for extraction of the chlorophyll, which is used as a green colouring agent (E140) in foods and medicines. A tea is made from the dried leaves, it is warming on a winters day. A bland flavour, it can be added as a tonic to China tea. The juice of the leaves, or a decoction of the herb, can be used as a rennet substitute in curdling plant milks. Nettle beer is brewed from the young shoots. A strong flax-like fibre is obtained from the stems. Used for making string and cloth, it also makes a good quality paper. It is harvested as the plant begins to die down in early autumn and is retted before the fibres are extracted. The fibre is produced in less abundance than from flax (Linun usitatissimum) and is also more difficult to extract. The plant matter left over after the fibres have been extracted are a good source of biomass and have been used in the manufacture of sugar, starch, protein and ethyl alcohol. An oil obtained from the seeds is used as an illuminant. An essential ingredient of "QR" herbal compost activator. This is a dried and powdered mixture of several herbs that can be added to a compost heap in order to speed up bacterial activity and thus shorten the time needed to make the compost. The leaves are also an excellent addition to the compost heap and they can be soaked for 7 - 21 days in water to make a very nutritious liquid feed for plants. This liquid feed is both insect repellent and a good foliar feed. The growing plant increases the essential oil content of other nearby plants, thus making them more resistant to insect pests. Although many different species of insects feed on nettles, flies are repelled by the plant so a bunch of freshly cut stems has been used as a repellent in food cupboards. The juice of the plant, or a decoction formed by boiling the herb in a strong solution of salt, will curdle milks and thus acts as a rennet substitute. This same juice, if rubbed into small seams of leaky wooden tubs, will coagulate and make the tub watertight again. A hair wash is made from the infused leaves and this is used as a tonic and antidandruff treatment. A beautiful and permanent green dye is obtained from a decoction of the leaves and stems. A yellow dye is obtained from the root when boiled with alum. Seed - sow spring in a cold frame, only just covering the seed. Prick out the seedlings into individual pots when they are large enough to handle, and plant them out in the summer. Division succeeds at almost any time in the growing season. Very easy, plant them straight out into their permanent positions. The leaves of the plants have stinging hairs, causing irritation to the skin. This action is neutralized by heat or by thorough drying, so the cooked leaves are perfectly safe and nutritious. However, only young leaves should be used because older leaves develop gritty particles called cystoliths which act as an irritant to the kidneys.